The Daily Digress: I like the way this kid thinks. I like the way this kid thinks. "When I'm a hundred years old, if I'm not dead, I'm going to do that." What tightrope walking is and that it's dangerous. How old is old enough that death is not that big of a deal. Sure, this number is different for everyone, but his is a hundred. That you can't walk a tightrope if you're dead. That his desire to walk a tightrope does not outweigh his desire to live to a certain age. I guess one hundred was a nice easy number. When you're five, which he was at the time, it must seem impossibly old. But if you read fairy tales and go to Sunday School, you know that "life doesn't stop at a hundred!" or whatever those cross stitch pillows say. I suppose you really have to weigh the risks. Tight rope walking, especially for a hundred year old, has a pretty good chance of resulting in death, I would imagine. "It's like having twenty new friends every single day." So, so true. Know what else? Don't tell the kids, but it looks mad cool, especially with the right outfit. Smoking in a vintage cocktail dress and sky high Christian Louboutins? That's hot. 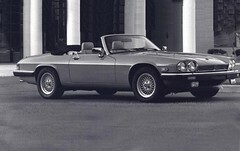 Smoking in a baby blue vintage Jaguar wearing big, expensive sunglasses and Louboutin flats would also be really cool. And I'm going to prove it. I'm already planning my look, obviously. I'm saving these shoes to wear then. They're actually Loeffler Randalls, but I'll alternate them with Louboutins. I wear them already, but I'm very careful, because they need to last. I don't have the car yet, because it's not so practical for a mother of three, but I'll get it. Maybe from my third husband. Or my girlfriend. So, when I'm eighty seven, if I'm not dead, I plan to smoke like a chimney in my baby blue Jaguar and wear expensive shoes. I'll probably go for the head scarf, too (Hermès, bien sûr!) I'm going to be a mad hot great grandma.